Before Allen comes up to watch Venture Brothers and then off to bed. Last night I didn’t quite finish this months part of M9. I will put it off until Friday, just getting it done before August’s part comes out. I am a bit nervous about what is on the horizon for that piece considering how much space is left and only five months left. Today, I primarily worked on Mylene’s RR. 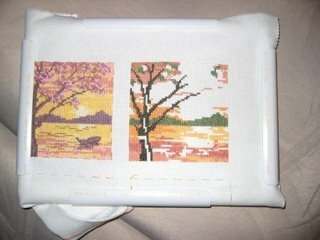 It is coming along nicely, but it does have some quarter stitches which can be a bit awkward on aida. Otherwise it is a very easy stitch.